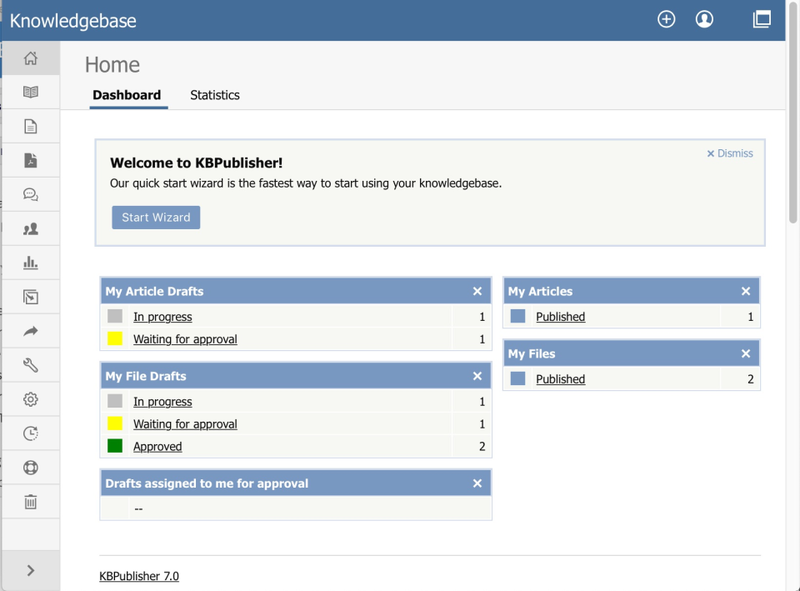 KBPublisher can help you give customers the answers they need and resolve issues quickly and efficiently. It can help your employees acquire job knowledge faster, reducing training time, and driving higher performance and job satisfaction. A knowledge base improves staff productivity and eliminates time wasted searching for information. Comments: Seven years ago, a small group of legal services organizations had been stuffing PDF files of training materials and government directives into a single HTML file on one of our websites. This was the best we could do back then to share our wealth of information on public health insurance programs with the public. We knew that we could do better, and decided to build our own website, as a joint venture between these four groups. We had no funding to do this, and were all stretched extremely thin by our existing obligations to represent low-income clients. 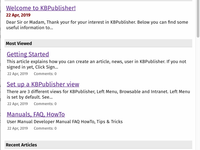 Fortunately, our consultant recommended KBPublisher to us as the best platform for our needs. For a tiny fraction of what we would have spent to get a custom website, we got a fully-formed knowledgebase system that JUST WORKED. Installation was as easy as one could hope for (we had our website admin on hand to deal with PHP and SQL issues). Administration on the back-end is a breeze. The latest version provides dirt-simple method for adding custom HTML (including Google Analytics tracker) and images. Very configurable. We have disabled many features that we don't need but which I think most people would find very helpful (comments, rating, subscriptions). I love the auto-RSS, workflows, automation, and built-in reports. The customer support is amazing. Evgeny personally responds to my requests, and is always courteous and helpful. My favorite thing is how our content authors can figure out the interface without constant hand-holding from admin (me). It has become an organic system that is mostly self-pruning, and is now relied upon by 15,000 users per month. Pros: It's cheap. But you get what you pay for. 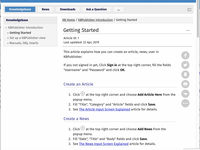 It's easy to add articles, but you can't assign them to other users to work on. It you try you get cryptic messages that even support doesn't know how to fix. Cons: We were on a trial of the cloud product. I went around in circles via email for three days with one of the support reps trying to get an answer to a simple question. His English was bad, and the "solutions" he proposed did not resolve my actual issue, and finally led me back to my original issue. We literally went around in a circle. It's a shame because we like the product itself. But the documentation is bad, with many broken links, and the support so far as been a complete waste of time. I asked him to cancel the trial, and he did so, within minutes, leaving me no time to download all the articles I had worked hard to add to the KB. It was my responsibility for not downloading the work I had done first, but I hardly expected a low-level rep (as he seemed to be based on his answers and communication skills) to have the power to lock us out so fast. I suspect this is a one-man operation and he's just overwhelmed trying to keep up. His quick lockout and sarcastic responses indicate he was acting out of malice, which is unprofessional. Overall: Support was sarcastic and unprofessional, and not willing to provide phone access to clarify my issue which they clearly didn't understand. I repeated the initial issue several times throughout the course of our three-day correspondence. He just didn't get it. A very arrogant person. She does not say hello, not goodbye and behaves as if the whole world should revolve around her. We explained several times what and how to do it, but we were not heard. Pros: It has a decent search engine if you can get your article loaded and the tags to take. Cons: I cant easily load anything quickly. Every article with pictures of any kind takes me hours. Its painful and I only do it because this is my companies knowledge base and i have no choice. Overall: The product is quite a difficult challenge to use as articles will not upload to a usable format and only copy paste has any partial functionality. Copy paste only allows half your content to add and often portions are reformatted or missing all photos. I have used many other engines which allow user friendly uploads of documents this is not one of those. I had to redo one article 5x before it would format. It will even time out on my use and then i loose everything i posted. OR- I get the whole article looking perfect pick save and it just disappears, no body only title visible and a small "pixel" in place of my article. Overall, very very painful process to use. Anyone know of a good Knowledge base that is easy to use and has a good search engine? Recommendations to other buyers: Find something easier... if you find it please let me know. Overall: What a great team to work with. Knowledgeable, professional and accommodating. Looking forward to a long lasting relationship. Recommendations to other buyers: Look no further. Great software package. Easy to use for administrator and users. Comments: We use this software to share technical knowlegde inside our Service and Support department. Right now also our Sales department is happy to use this simply shared information wich is always available for them. We already used this software in a earlier V2 release . Now we did a new installation in the latest V5 release and made an import from our old dbase to the new one. All with automatic dbase conversions and imports without any problems. This newest version gives us a lot of great new features to work with. Comments: Omnisens (www.omnisens.com) started to use Knowledge Base more than 5 years ago as a "private" internet site to support our agent, distributors, as well as our Service partners. 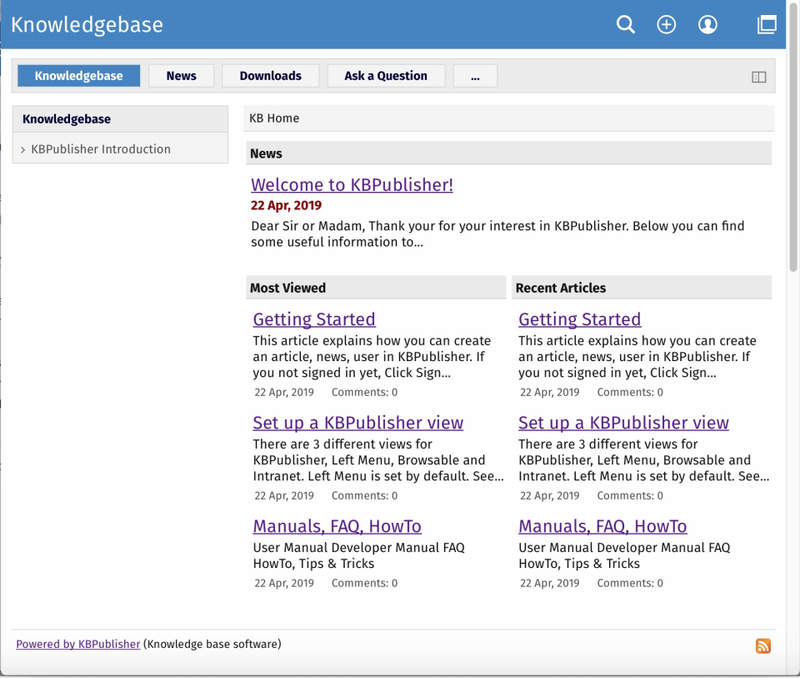 Knowledge Base is inexpensive, easy to setup and can scale from one-man corporate to large enterprise. 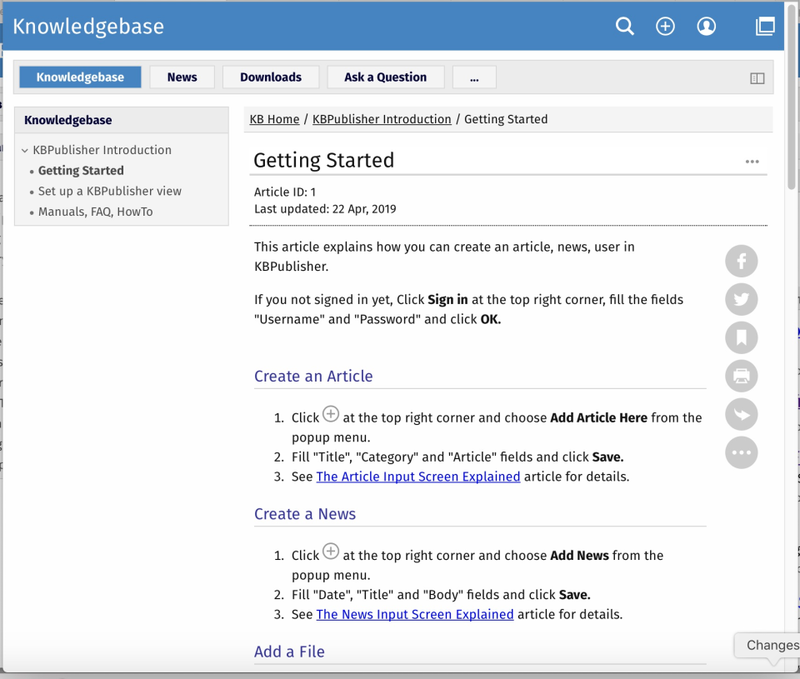 As of today, Omnisens is still using Knowledge Base as it is a powerful business tool. Comments: The support guys are active and helpful, they even look over my site and suggest fixes proactively. The software is easy to use if you have working knowledge of running a server. It does what we need quickly and efficiently. Comments: Easy to use. Very versatile. Can be used for a wide range of applications. I have used it for an educational knowledgebase. Uploading resources and video links proved very useful. 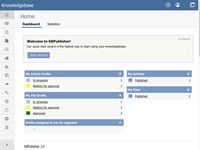 Comments: We researched various KB software options and found KBPublisher fit our needs perfectly. The few times we needed assistance they were very responsive. 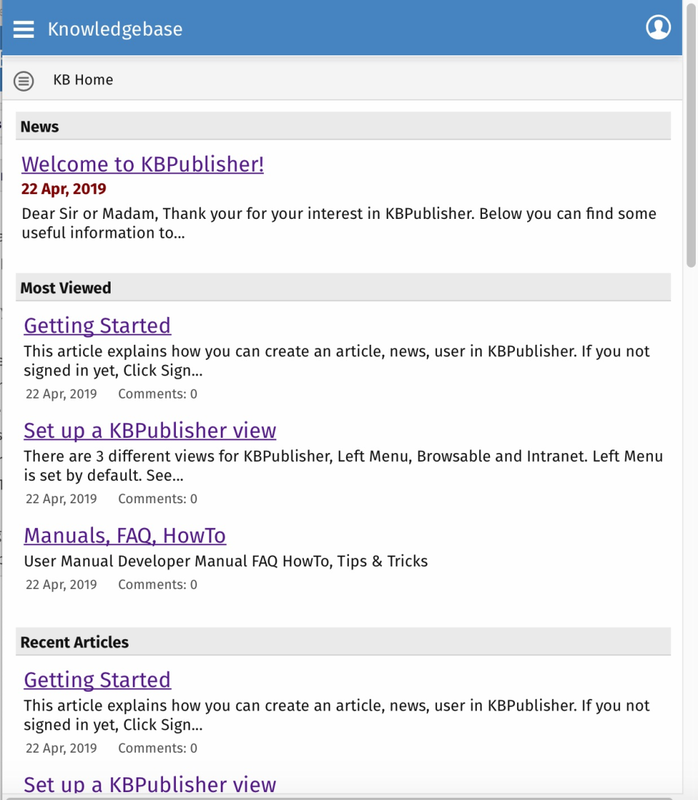 Comments: KBPublisher is a great product. We use it since many years. It is fast, easy to explain and it reduces requests from customers on FAQs. Comments: Your tool fills a very narrow niche, which is hard to do. Thank you for your commitment to excellence. Comments: KBP assists in the systematic process of knowledge management, helping us to develop and maintain our knowledge base. Comments: Easy to manage, flexible with great admin features and very responsive support. Great KB system for the price! Works well, significant problem is pdf export. 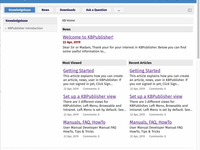 Comments: We have generally satisfied with KBPublisher. Admin UX is not so great but we can live with that. The problem we are experiencing is exporting to pdf - we have bought Export plugin to have better pdf export but now it is broken with UTF-8. We might swith to another product if there is no solution to pdf export (preferably customizable) with UTF-8 support. Ready solution for user self-support and intranet. Pros: Clean, powerful, adjustable, good customer support. Cons: Should be installed at web server (with database). Overall: Helped us very much.